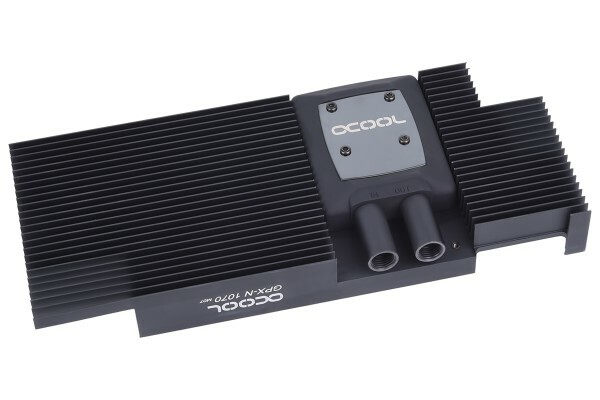 Alphacool is making great strides with the new NexXxoS GPX cooler! This new cooling concept offers optimal performance and quality at a reasonable price! The GPU is actively cooled through ingenious new injection technology. All the other chips are sufficiently cooled through the passive cooler in which the GPU water cooler is enclosed. The cross slot technology in the base plate, patented in 2004 and used in the Alphacool NexXxoS XP, has been developed further. The fins and channel structure have been refined. The remaining panes are 0.5 x 0.5mm in size and 2.5mm tall. This enables a very large and fast rate of heat transfer from the copper to the coolant. Through the outside-facing inlet and outlet, this cooler can be used in SLI configurations with little difficulty. This way, up to four graphics cards can be connected with the Alphacool GPX SLI Connector. Every cooler now includes a backplate which uses little passive cooling fins to cool the graphics card again, as well as giving the graphics card a finished appearance and protecting it at the same time. Passive cooling happens through perfectly balanced, barely 18mm deep cooling fins, which completely cover the remaining parts of the graphics card. Light air circulation in the case means this cooler is in no way inferior to conventional coolers.